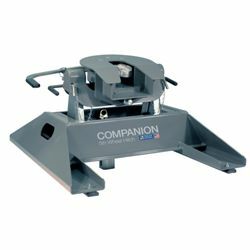 How do I tow a Fifth Wheel Trailer with my Gooseneck Hitch? This Fifth Wheel Hitch sits right on top of a B&W Turnover Ball. Pull only 1 pin and the hitch removes completely from the bed. A great option if you want to frequently switch between trailer types. If you don't have the B&W Turnover Ball Gooseneck Hitch System, go to our under bed gooseneck hitch category and search your truck to find the complete setup for you. OPTION #2: A second option is a 5th Wheel Adapter that bolts to the king pin plate. 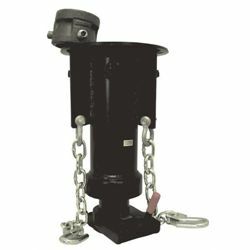 This adapter lets you tow your 5th Wheel trailer with your gooseneck hitch by simply bolting to your trailer's king pin and connecting to the gooseneck ball. These adapters have to be the correct height to tow the trailer. Measure from the top of the gooseneck ball to the bottom of the king pin plate. Warning: these adapters are not compatible with sidewinder or air ride 5th Wheel king pins. i already have the b w turnover ball hitch on my 2000 f350. but i want to change to a 1999 f450 cab and chassis.do you have the proper brackets for the 99 to change over to it. i understand the cab and chassis has a narrower frame. do you have the kit so it is a bolt on. also i am in british columbia and do you ship out from canada. Hello Anonymous, Our Gooseneck systems can be found here: https://www.hitchweb.com/category/HD-B-1/Gooseneck-Hitches Are you looking for above bed or below bed gooseneck system? Once we have this information we can assist you further. Our team will also contact you via email. Hello Deanna, Are you towing a 5th wheel trailer or Gooseneck trailer? What Gooseneck hitch does your father have? Do you have rails in the bed of the truck that you are using? Once we have this information we can assist you further. Our team will also contact you via email. I have a gooseneck hitch in my dad's garage that he wants me to use, but I've never used it before to tow a trailer. These tips seem really great if the hitch ball is already installed in the bed of my truck. What should I do if there isn't a hitch ball? I've only ever set up a truck to a trailer that already had a hitch ball, so I need a few instructions to make sure that I do it right.